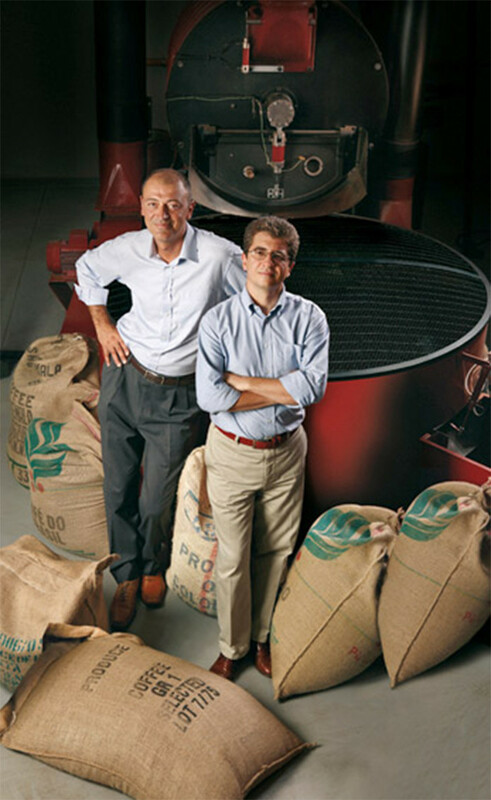 Corrado Bassanese and Fabrizio Polojaz, Italian coffee artisans from Trieste. Primo Aroma is the company of Trieste which better understands the unavoidable handmade nature of any quality product. Defining coffee a “product” does not give credit to the coffee cup nature that has so many situations, moments and perfect occasions; because behind the coffee exists a complex, varied and - mostly - construable world, as behind the thoughts of who consume their daily ritual of gratification with a cup of coffee in their hands. In fact there are many ways to do things, and Primo Aroma is made in our own way. We, Corrado and Fabrizio, have been working with coffee for our whole life, around the world, in many areas, soaking in the job of who plants the coffee, who makes it grow, transports it and roasts it, for then being compared to the judge of such a hard work: the market. Or rather, the consumer, who will decree only after one sip, if the blend is worth enough to be drunk in such an intimate moment as breakfast or a break from the daily routine are. because we have understood that only the fineness in the composition of blend (our First Love) could have satisfied demanding and strict customers. There is not any industrial process that will ever fully satisfy an Italian, Serbian or a Chinese consumer, and there is no global strategy that will ever instil in the blend the constant improvements that we use everyday to maintain the quality level which our customers are used to have. For these reasons we allow ourselves to interpret the coffee market in our own way. We deserve our success. We allow ourselves to introduce us on our website in this way: without aseptic and abstruse texts that mention “business units dedicate” or “global market segmentation”, but with hands dirty of coffee and with the roaster’s crackling that keeps us company, while we are dealing with the orders towards the whole world. This is why we brag ourselves to have our pictures and our signatures on each package of Primo Aroma products. Thank you if you will choose us: it will mean that you enjoy good things. And it will mean that passion has won over big industries, as it should always be.